In the Netherlands, solar district heating plants with a capacity of 140 kWth or above can benefit from a feed-in tariff scheme called SDE+, which pays a certain amount per kWh of energy. Under the scheme, operators of renewable energy plants can apply for a subsidy to bridge the gap between market price and cost of energy production. Consequently, interest was high when a workshop about solar district heating (SDH) took place in mid-April 2017. 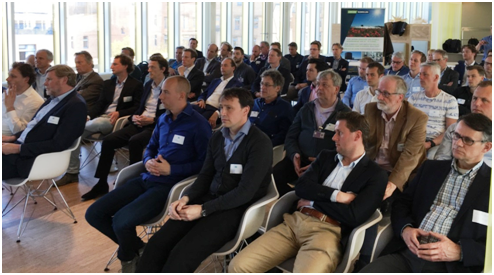 It attracted around 50 people from the district heating and the solar thermal industry, consulting businesses and the government. Organised jointly by Dutch district heating organisation Warmtenetwerk, Holland Solar and the Netherlands Enterprise Agency, RVO.nl, the workshop featured a presentation on SDH in Denmark – held by Jan Erik Nielsen from PlanEnergi and based on results from Task 45 and 55 of the IEA Solar Heating and Cooling Programme – and provided information about the national subsidy scheme, thermal storage technologies as well as the only DH plant in operation in the Netherlands to date. In 2016, SDE+ approved funding for around 62 MWth in solar thermal plants. Many applications were about heating systems for orchid greenhouses, where the collectors come from Dutch importer Zonneboilerpro. The first of these systems is now under construction. Lex Bosselaar, who works at RVO.nl and used to represent the Netherlands within the IEA Solar Heating and Cooling Program, views this first system as critical for others that could follow: “The development of this new market will depend a lot on the performance of the first systems,” he said. Not all projects for which funding has been approved will be realised. The SDE+ budget is financed by a levy on electricity prices. If there are funds left from a not realised project, they will be made available for other projects or used to reduce the charge added to electricity costs. There has also been a maximum tariff specified for each technology to reflect differences in the cost of production. In the case of solar heat, it was 9.5 EUR cent/kWh during the application period in spring 2017. Producers of solar heat can freely choose a tariff amount on their application, as long as it does not exceed the maximum for their technology.